Pumping is awesome. I’m a huge advocate of it, especially if you’re a working mom and won’t be staying home. The only real problem is that it can sometimes be a pain to pump at work. I struggled with it at first using a small manual pump until I broke down and looked around for something better. It’s not easy to pull off at work; you’ll probably need to do it during a break, so it needs to be both fast and discreet. Luckily, I think I’ve found what just might be the best breast pump for working moms! 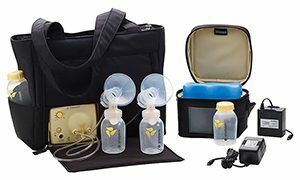 For most working moms, I think the Medela Pump in Style Advanced (click here to check price on Amazon) by far the best breast pump for many reasons. This is the one I switched to and I didn’t regret it for a second. Sure, it’s a significant investment, but it’s well worth the price. It’s a double-electric pump, and it can run on either AA batteries or by plugging it into the wall, so you can use it wherever it’s most convenient. I used it in my office, but you could also use it in the car or anywhere else if you can. Running it on batteries is not quite as strong as using it plugged in, but it still works pretty well, and you can get about 15 pumping sessions out of a set of batteries. I’d recommend getting some rechargeable batteries to use along with it. It pumps very fast, since it’s a double pump. You can finish a pumping routine in about 10 minutes, which is way more than fast enough if you have to do it during your break. If you’re worried about it being discreet, well you’re not going to want to do it around other people, but it’s pretty quiet and you can do it without anyone hearing it. There are 3 versions of this pump that come with different carrying options: a backpack, a tote and a metro bag. I don’t like the backpack version, but the other 2 are pretty nice. Both are black and discreet and fit everything you need to use it, including the stay-cool refrigerated bag (which is a necessity if you’re going to be pumping at work!). It has extra room, so you can put anything else you might want to carry in it too, like your keys, cellphone, work stuff, etc. It’s really convenient and I used it instead of a purse when I took it to work. I brought my lunch to work, so I put it in the refrigerated cooler bag. The metro bag (click here to check the price) doesn’t fit everything inside. However, there is one big advantage to it: the motor of the pump, which is the heaviest part, is separate and can stay in its own bag, so you could just leave it at work from Monday to Friday and just bring the pump part itself home to wash during the week. This might just be the one thing that makes you get this one over the tote, but I personally went with the tote. The metro bag doesn’t close all the way, so if you have to take public transport or travel any significant distance without a car, it might not be the best option. Not only is this the best breast pump for working moms, but I think it’s the best pump period. Even if you’re a stay-at-home mom this thing is a godsend, and you’ll end up using it even more at home than you do at work. Considering all of the above, I think this is the ideal choice for most working moms. I know I loved it! If you decide to go with the Pump in Style Advanced, I’d recommend 2 other things to go along with it. First of all, I’d get some good rechargeable batteries if you plan on using it this way. It takes 8AA batteries and they last about 15 pumps, so it can get rather expensive to buy throwaway batteries for it. I recommend the ELB charger that comes with 8 AAs (click here to check price on Amazon) – they’re great batteries and you just have to remember to charge them up once in a while. You can also get the pack with 16 batteries so you always have a extra set, but I don’t think it’s worth the extra cost. It’s up to you. I’d also suggest a good pumping bra; a good and popular one is the Simple Wishes bra (click here to check price on Amazon). What this is, is a bra that is compatible with pumps, including the Pump in Style. It’s a hands-free bra, so you can do other things while you’re pumping, but the biggest advantage is that it helps you pump quickly and discreetly at work. You may or may not want one of these, but I think it’s a good addition to the pump for those of us that are going to be pumping at work! The things you should know to help you make your decision. An all-too-common problem for breastfeeding moms. The three reasons it might be happening to you. #2 is definitely my favorite. 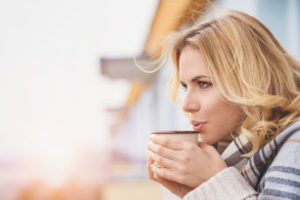 Is It Safe To Drink Coffee When Breastfeeding? What Are The Concerns? Find out the risks of enjoying a cuppa.